Alfonso Gagliano hopes that his legacy will be more than just a long political career that ended in scandal. Months away from his seventieth birthday, Gagliano doesn’t follow politics anymore, despite spending almost twenty years in federal politics. Right now, his focus is on winemaking. It’s mid-October 2010, and Gagliano Vineyards – in the town of Dunham in Quebec’s Eastern Townships – is in full harvest mode. Harvest has arrived ten days early this year. With a pipe in hand – a ten-year old habit that has now become a daily exercise – Gagliano takes a break from the workday to offer a tour of his vineyard. It’s an impressive estate that spans 90 acres of land, grows 20,000 vines, and produces an average yearly yield of 35,000 bottles. Winemaking is not a new passion for Gagliano. 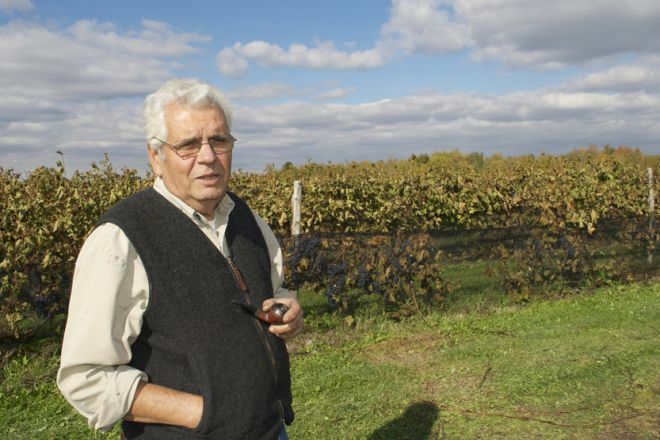 Like many Italians in Canada, Gagliano made his own wine at home. He even had 80 grape vines growing in his Montreal backyard. “I always thought that in my retirement I would have a small vineyard, just to grow my own grapes, make my own wine. I just never imagined it would be at this level of production,” Gagliano muses. “I always had more of a passion for wine drinking than winemaking,” Gagliano’s 45-year-old son and partner, Vince, jokes. “I used to help my dad at home with the winemaking. And then when I was twenty-five years old, I started making my own batch of wine. And now here we are,” Vince continues. It was actually Vince who found the 20-year old Le Vignoble Les Blancs Coteaux vineyard which he now owns with his father. In early 2008 Vince – then in the packaging business – was on the lookout for new clients. During his research he discovered the vineyards in the Eastern Townships. “I didn’t even know wine was made in Quebec,” he admits. In April of the same year, Vince and his wife decided to take a weekend drive with their young daughter to visit the local vineyards he was now doing business with. Two hours later they were in Dunham. Four months later Vince and his father owned the deeds to Le Vignoble Les Blancs Coteaux. By the following spring the first batch of Gagliano Vineyards wine was already on the market. Alfonso Gagliano was born in Sicily in 1942 and immigrated to Canada at the young age of sixteen. He worked as an accountant. In the late seventies he was elected as a school commissioner. Always a loyal member of the Liberal Party of Canada, he was first elected to the House of Commons in 1984 representing the Montreal-area riding of Saint-Leonard. He would remain the Liberal official for the riding until 2002. Throughout his political career, Gagliano served many functions for the Liberal Party, but it would be his time as Minister of Public Works and Government Services from 1997 to 2002 that would make headlines in Canadian newspapers and accelerate his departure from active politics. Gagliano’s ministry was responsible for a $250 million program created to raise Canada’s profile within the province of Quebec after the close results of the 1995 Quebec sovereignty referendum. But auditor general reports in 2002 and 2004 revealed that $100 million from the program disappeared into ambiguous sponsorship fees paid out to Quebec advertising agencies, many of which had ties to the Liberal Party of Canada. Gagliano left cabinet in 2002 when he was appointed as Canada’s ambassador to Denmark by then-Prime Minister Jean Chretien, only to be recalled in 2004 by Paul Martin who had succeeded Chretien as prime minister. Throughout the so-called sponsorship scandal, during which he took the brunt of the criticism, Gagliano vehemently denied any wrongdoing and maintained that he had no knowledge of the misdirection of funds. In 2004 he filed a $4.5 million lawsuit seeking compensation for wrongful dismissal and damage to his reputation. In the fall of 2006 he released Les Corridors du pouvoir, an autobiography that tells his version of events. Since then, Gagliano has stayed away from politics, and says that he doesn’t even follow it. Nor does he want to talk about old wounds. “I keep busy here,” Gagliano explains. “I don’t even watch the news. The only television I watch is Italian programs and the weather channel,” he continues. Gagliano and his wife, Ersilia, live in Dunham year round, while son Vince commutes to and from Montreal. The work is hard and the days are long, but neither father nor son complains. “It’s a fun business. You are part of an entire process from beginning to end, from working in the field, to bottling, to promotion, to selling. You are actually creating something from nothing. I love every moment of it,” Vince explains. “We are trying new recipes, new products. It’s like cooking,” Gagliano adds. The first trial recipe was Donna Livia, a sparkling wine named after Vince’s daughter. The first batch of 1200 bottles was put on the market in 2010 and by the end of the year only six bottles remained unsold. 8000 bottles of Donna Livia will be available in 2012. “Quebec is the perfect place to make sparkling wine because of the cold weather. High acidity, low sugar. I was surprised myself by the outcome of our trial,” Gagliano explains. He and his son plan to expand the vineyard and upgrade the actual winemaking process. They planted more vines earlier this year, and have plans to double their output within the next five years. Their biggest challenge in the coming years will be to get their wine on the SAQ (the Quebec Liquor Board) shelves. At the moment they sell only to visitors at the vineyard, at various local wine festivals like the annual Fête des vendanges Magog-Orford, and to Quebec hotels and restaurants. Most Quebec vineyards sell this way. Quebecers seem more interested in buying foreign wines at the SAQ than locally produced wines. And so vineyards like Gagliano must rely on direct sales. “We have to work at convincing people that Quebec wine is good,” Gagliano says with assurance, in a tone almost reminiscent of his days in politics. “There’s a psychological barrier when it comes to appreciating local wine. If people taste the wine without knowing where it’s from, they like it. As soon as you tell them it’s made in Quebec, they refuse to believe it,” he continues. Alfonso Gagliano stares at his vineyard, looking over his labour of love, ready for another harvest. The crisp politician’s suits are in the back of the closet. He is content in his blue jeans and cotton shirt, with one hand in his vest pocket and the other holding a pipe. Politics is a faded memory. 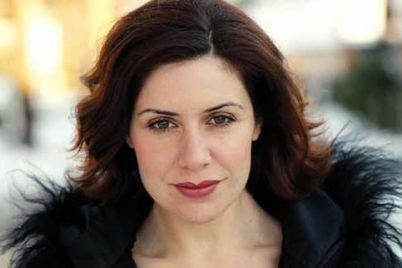 Agata De Santis is a Montreal-based writer and filmmaker. Her blog is at www.italocanadese.com.